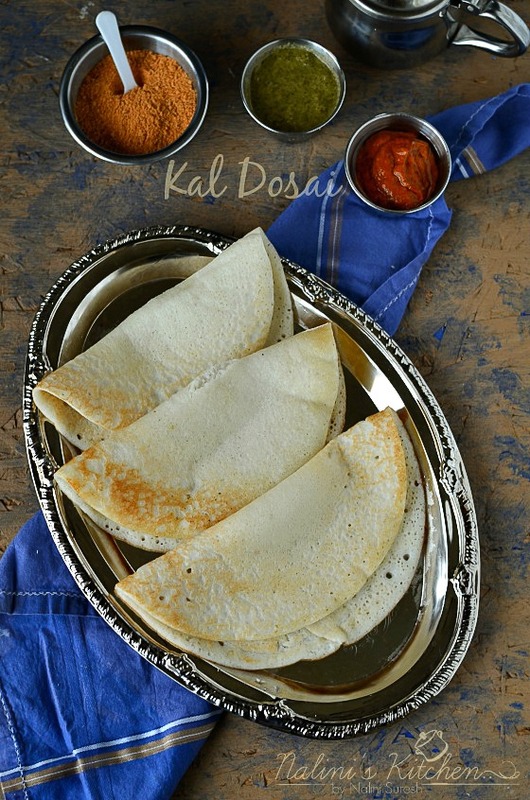 Today's recipe is yet another soft dosa made in our households for breakfast or dinner.Kal dosa is popular dosa variety in South India and traditionally an iron griddle(kal means griddle Tamil) or earthen griddle is used,hence the name Kal dosai. The highlight of this dosa is raw rice is used for this dosa and this dosa is very soft even after for several hours. Next day or after the fermentation mix the batter well and take the required amount of batter to make dosa.Adjust the consistency with water. Heat a griddle and one it becomes hot ,add a drop of oil and wipe it off with a paper and keep the flame in high.Pour a ladleful of batter and spread it into a thick circle.No need to spread it to a thin crepe.Once the pores started forming on the dosa,reduce the flame and cook it in a medium flame for 2 minutes.Drizzle a tsp of oil. Flip it to the other side and cook it for 30-45 seconds.Remove it from the griddle. Serve it with chutney and idly podi. Batter consistency is very important to get a nice and soft dosa. 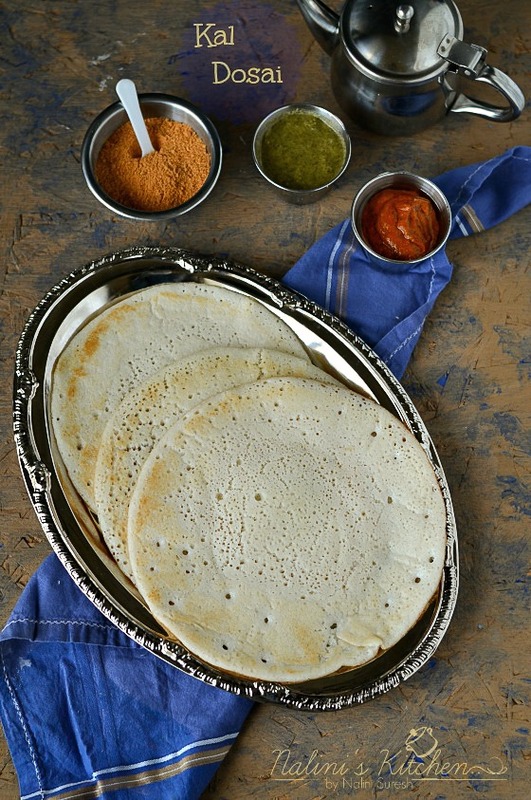 Do not spread the dosa to a thin crepe. After flipping the dosa if needed drizzle some oil. I recommend to use an iron griddle to make the dosa. Podi smeared dosa is mouthwatering!! Drooling over the pictures. Beautiful pictures as always!! OMG ! 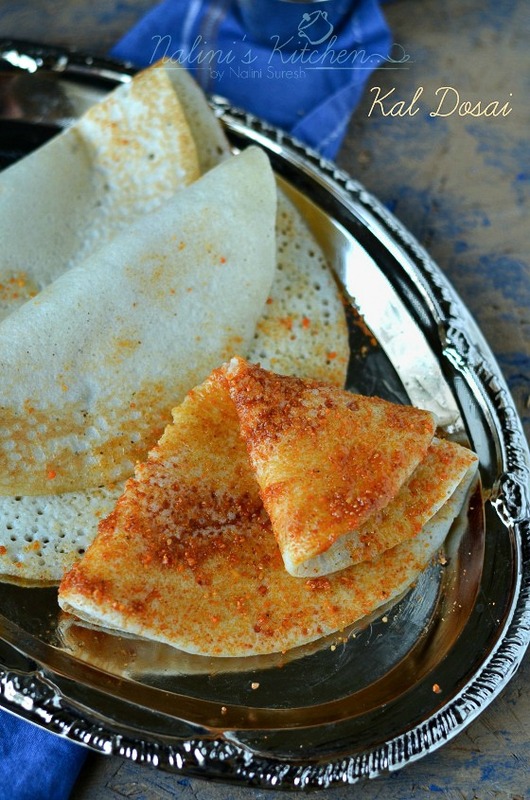 You have left me speechless with Kal dosa .I am drooling over these and the one smeared with spicy powders is a killer ! I just want to grab it off the screen . Kal dosa looks so soft! Love the podi smeared dosa... looks yum!! 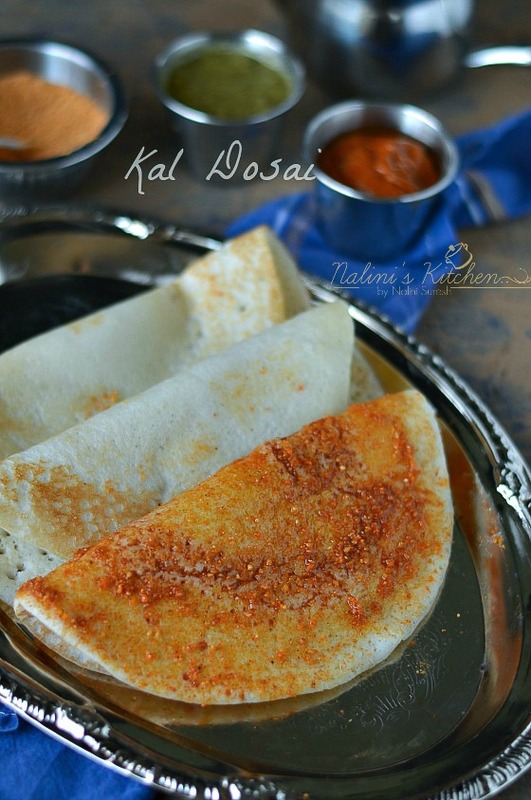 Wish u send me a parcel of this kal dosa, especially i love the one with idly podi, mouthwatering here already. I am literally drooling on that idli podi smeared dosa. It looks so yum..
Kal dosa looks gorgeous .Love all the pics and the last one is fabulous. The podi drenched dosa is drool worthy. Lovely dosas!! Such a soft and delicious looking kal dosa. They must have tasted awesome with idli podi. Lovely choice. 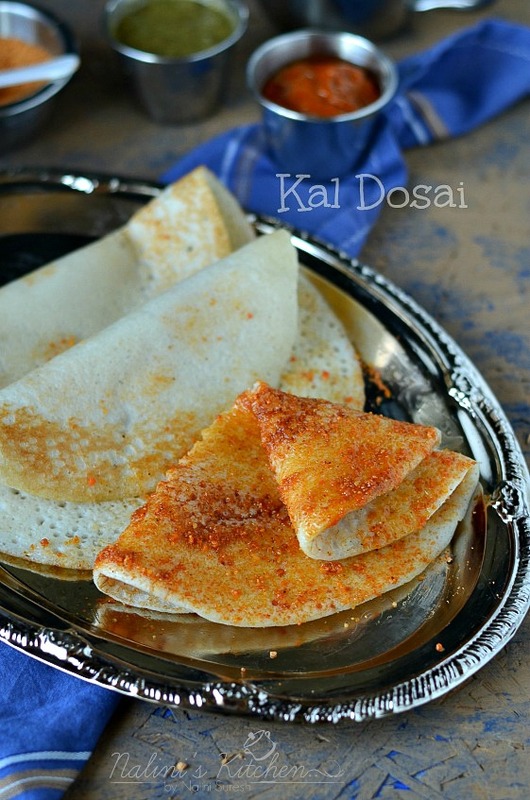 I have made this dosa a few times following Veena's recipe and is liked at my home. Looks so inviting Nalini. I have a different proportion for Kal dosai and don't flip it on the other side to cook..
nalini, podi smeared dosa, i couldn't take my eyes of it, i can literally smell the garlic chutney here!! yummm!!! Such a wonderful dosa. Bookmarked immediately!